Muircheartach Ó Cionga, or Murtagh King, as he is better known, was vicar of the Church of Ireland parish of Templeport from the early 1630s until about 1638, when he was arrested and imprisoned in Dublin on suspicions of Catholicism. He is most famous today for his collaborative work with Bishop William Bedell on the Gaelic translation of the Old Testament, a project on which King was principal translator. King’s origins are lost to us in the mists of time, but it is likely that he was from Offaly, or perhaps Westmeath, and was part of a well-known family of poets and scribes. 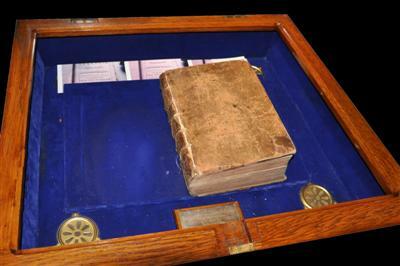 King first met Bedell in 1628 when Bedell was provost of Trinity College Dublin. 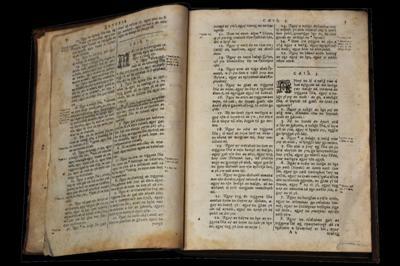 Bedell, who was always interested in languages, employed King to teach him Irish, and King along with an associate, James Nangle, translated the psalms into Irish for use in the college. 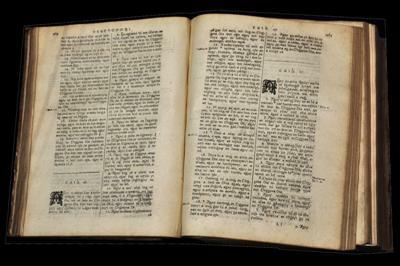 Bedell believed strongly that for the Protestant Reformation to succeed in Ireland, it was essential for the ministers to have a working knowledge of the Irish language – for how else could the Church of Ireland hope to persuade the Gaelic Irish Catholic population to accept Protestantism if they could not speak the local language? Bedell was appointed Church of Ireland bishop of Kilmore and Ardagh in 1629, and not long after had moved King and Nangle to Cavan to work on the translation of the Old Testament with him at Kilmore. To support King financially, Bedell appointed him to the parish of Templeport. Although formerly a Catholic, King seems to have accepted the post with no major qualms. Later on, however, it was alleged that King failed to serve the Protestant community, doing as little as possible in his post as Church of Ireland vicar of Templeport, instead resuming his Catholic beliefs for the most part. Indeed, his wife and children continued to live as Catholics, causing much annoyance to other Church of Ireland clergy in Kilmore. Bedell proved unpopular among his clergy due to his defence of Catholics against persecution and quickly made enemies in Kilmore. 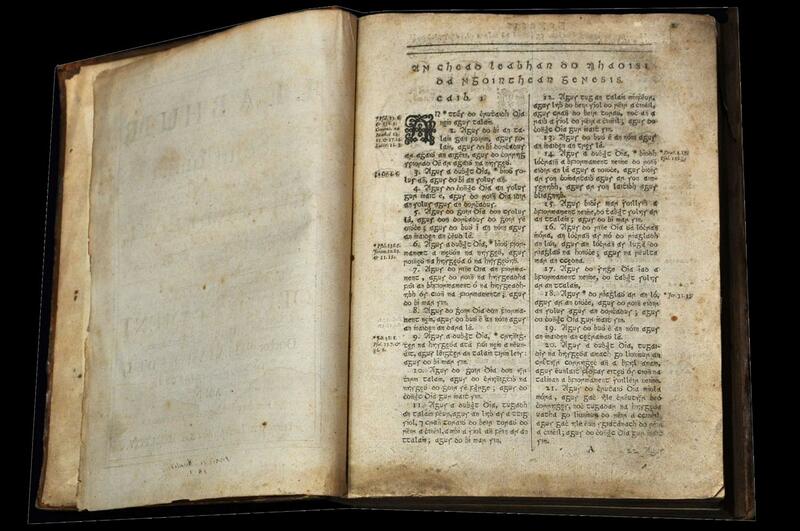 His clergy also felt that the Irish language was beneath them and in 1638 began to accuse King of Catholicism and a general ignorance in Protestant theology and practice as a means of undermining Bedell. King was arrested and imprisoned in Dublin and despite Bedell’s best efforts, the Old Testament translation which he, King and Nangle had worked on remained unpublished until 1685. 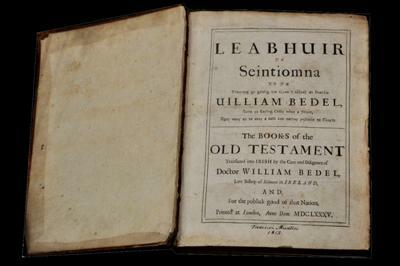 Bedell died in early 1642, his health broken by a stay on Clogh Oughter during the winter of 1641. It is unknown what happened to King following his arrest in 1638, but it is likely that he died in late 1638 or early 1639, prompting his Catholic wife to move back to Offaly. 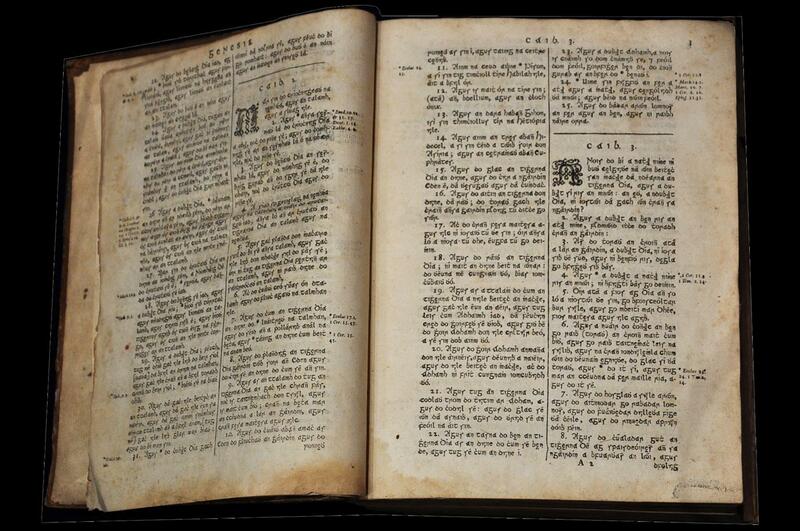 Although dying in poverty and ignominy, King’s legacy lives on in his vital role in the first Gaelic translation of the Old Testament. 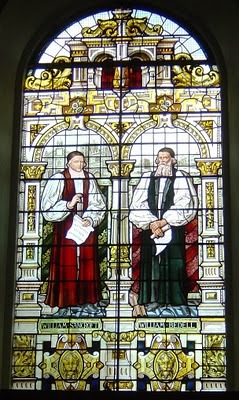 Bishop William Bedell of Kilmore in a window of Emmanuel College Chapel, Cambridge. 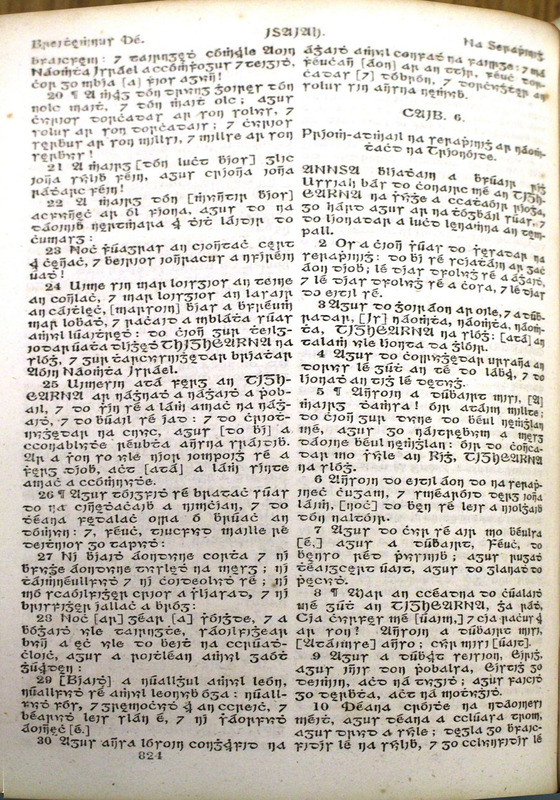 Pages from the first translation of the Bible in to Irish. Click on the images to download larger versions then use your 'back' button to return to this page. 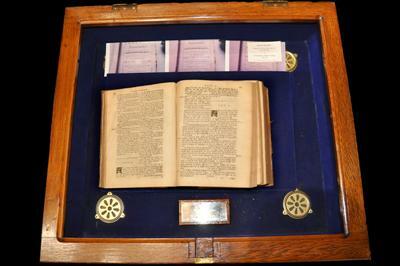 The six photographs of the Bedel Bible above were taken with the permission and assistance of Bishop Ferran Glenfield and Very Reverend Dean W R Ferguson of Kilmore Cathedral. A recording of Michael Glenfield reading from Isaiah Chapter 6 verses 1-8 from the original Bedell Bible held at St Malachy's Parish Church, Hillsborough, Co. Down is available here. Please click on the image on the right to open a larger version of the photograph then use your 'back' button to return to this page. 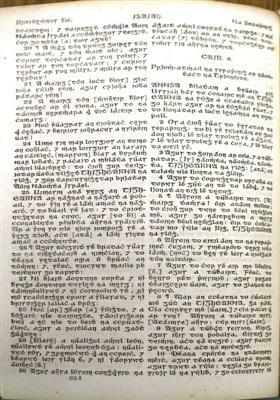 Many thanks to Jonathan Smyth of the Johnston Central Library, Cavan for sending us this photograph of the page.